And Visitors / Viewers across the Globe !! 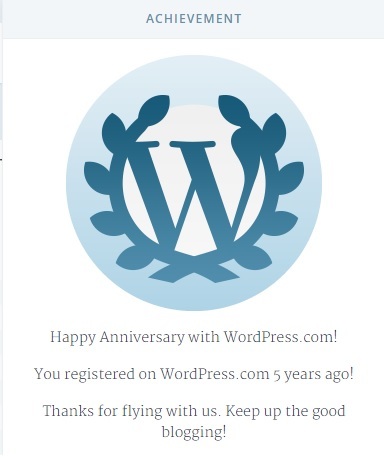 Well, it was great to see a CONGRATS message for my 5th Anniversery on WORDPRESS. Five years of association, it has to be overwhelming but in actual I had a mixed reaction on reading it. I am really grateful for the platform that WordPress provided me, and equally thankful to all my WordPress buddies here whose constant support, comments , appreciations and criticisms have helped in crafting out a better writer out of me. The regular interaction & sharing of thoughts have given a new direction to my thinking and have kept my spirits high , provoking me to write more and more. These 5 years of journey has been inspiring and enjoyable except the last lap, where I started facing the most terrible phase of “Writer’s Block”. But, the Anniversery notification from WordPress did it’s part, igniting my sleeping brain & instructing it to get up. On this 5th Anniversery, all I want is to continue my association for many more years to come. So, its time to write, time to interact, time to expand my circle on WordPress & I am sure I WILL DO IT !! This entry was posted in Awards and tagged Akanksha Rastogi, Awards, Be positive, Blog, friends, Life, MISCALLANEOUS, opinion, THANKS, WORDPRESS, WORDPRESS ANNIVERSERY, Writing by Akanksha. Bookmark the permalink. Congratulations, Akanksha! What an accomplishment (5 years). Way to go and hope you have many more. So nice to hear from you. Your words of appreciation always fill me with new zeal & energy. You have always been a great source of inspiration & motivation. Can you please share your E-Mail ID? Keep in touch, Take Care & Have a good day !! That’s a very long journey of 1825 plus days….. keep writing. I am happy to see some one who is using this platform for so long. Wish you many many great happenings and big smiles to be yours every day. Cheers.